Where do manta rays live? Manta rays are marine animals whose life passes quietly in salt water. Broadly speaking, manta rays are distributed in tropical, subtropical and temperate oceans worldwide. Therefore, they are not species that tolerate low temperatures, and instead thrive in warm waters. Each species has a specific distribution. If it comes to the reef manta (Manta alfredi) the range mainly covers tropical and subtropical waters of the Indian and Pacific oceans, although its distribution is not continuous and there may be areas where manta rays are not present. In turn, the Atlantic Ocean has also become home to the species, but sightings in its waters have been rare. The reef manta ray has a wider distribution than the giant manta ray (Manta birostris), but their sightings are very common especially in the Indian Ocean from the Red Sea to the western Indian Ocean and from Thailand to Indian waters that bathe eastern Australia. In fact, it has been seen regularly in Hawaii, Thailand, Japan, Australia and South Africa. For its part, the giant manta ray extends widely in tropical and temperate waters of the Indian, Pacific and Atlantic, between 31 degrees north and 36 degrees south latitude. Sightings of this species are less frequent than those of its reef relative, and are believed to have a slightly more solitary behavior. Manta birostris individuals have been seen in the east and west coasts of the United States, Japan, Egypt, the Azores, Peru, Uruguay, South Africa and New Zealand islands, among others. 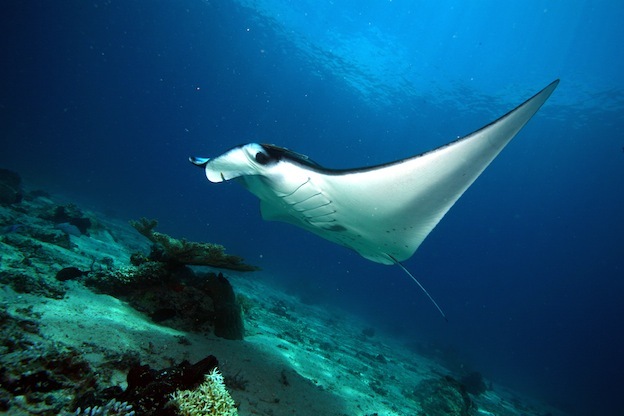 The reef manta ray’s habitat is less oceanic compared to that of the giant manta ray. Usually it is located in places close to the coast of shallow water, around groups of islands, reefs, atolls and even bays and seamounts. By contrast, Manta birostris usually moves across the ocean but also inhabits shallow reefs and regularly visits cleaning zones to allow other fish to eliminate parasites and dead skin from their body. Despite their status of marine species, it is known that in some regions like Hawaii they can enter freshwater banks for reasons such as finding food or evading predators. For some scientists, this study provides an opportunity to use lagoons as safeguarding resources for manta rays. Manta rays show no territorial behavior. Are fish that every so often move from one region to another; an activity which is called migration. The giant manta ray could be a slightly more migratory species than the reef manta; it is though it could travel through more than 1,100 kilometers in a straight line. The reason? Possibly travels in search of areas rich in food or warm temperature. In any case, migration and the daily movements of these fish are influenced by the course of ocean currents that carry its appetizing food: plankton. Meanwhile, Manta alfredi is a little less migratory and usually stays longer in certain places, so its migrations are shorter. In English it also receives the names of “resident manta ray” and “coastal manta ray,” referring to its habit of residing longer in specific areas. Their daily migrations can cover about 70 kilometers, but the seasonal migrations vary from region to region. For example, individuals in the Maldives move to distances up to 270 kilometers away. A not inconsiderable number at all.